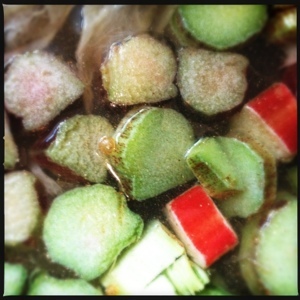 With a present of some home grown stalks of rhubarb and not a lot else in the house I set to work making some jam. 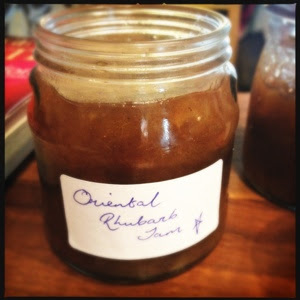 It turned out a little spicier than I intended and is probably more aptly named Oriental Rhubarb Chutney than jam! 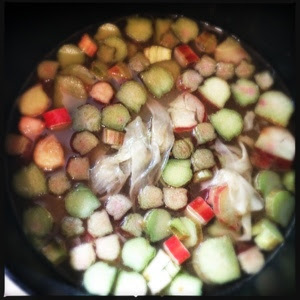 Put all the ingredients in a pot and bring to the boil. Then simmer away until everything is nice and squishy and the liquid has reduced down to a syrup. Pour into sterilised jars, leave to cool and then cover. I put mine into small jars to give to people as presents! 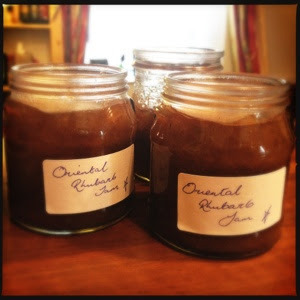 It makes about 3 small jars, or one regular jam jar, so you might need to double up the mixture if you want to make a big batch. Good with crackers and cheese or maybe as a dip on the side of some spicy food!